I've noticed recently that a lot of the home decor stores use books to decorate. They are stacked and sometimes tied with hemp. They are placed on shelves or coffee tables. Well I only own ugly books. Well, most of them are ugly. So today we're making books worthy of decorating a home. I went through some of the books in our home. This puppy was screaming for a makeover. 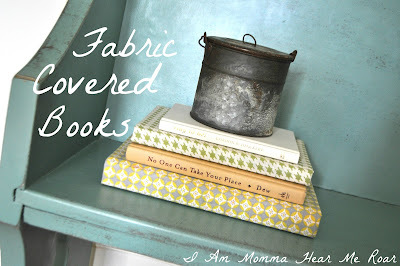 This project is a great way to use up scrap fabric. I got out a stack of books, my scrap fabric, and Aleene's Fabric Fusion. This adhesive works really well with this project, as hot glue can't be spread thin. I cut a piece of fabric a little bigger than the book when opened. I brushed on a coat of fabric fusion on the top and along the spine. Then I folded the fabric onto it, flipped the book and did the other side. I opened the book and trimmed the fabric inward as shown by the spine. Then I brushed the edges of the fabric and book and folded them in. ....and then gluing it flat. You could glue in a piece of paper to cover the fabric inside, but since I wasn't going to be opening the book that often I just left it. I also glued the little edge near the spine. Make them in all sorts of colors to add a pop of color to a room. Tie them up with a string or a belt. Use them as decor. Mix and match them with other books. That looks great! I've never been able to master this technique...seems the fabric ends up puckering or wrinkling, especially when I open and close the book. I'll have to follow your instructions.